Randy Petersen has been called such monikers as Frequent Flier Guru and Travel Visionary due to the millions of miles which he has traveled around the world — as well as being known for starting such entities catering to frequent fliers as InsideFlyer, the Freddie Awards, FlyerTalk and BoardingArea to help millions of people travel for free or at a significant discount. He has been interviewed by countless reporters in a plethora of media over the years; and he never misses an opportunity to express how truly fortunate he has been in life — especially when one considers his humble beginnings. Randy Petersen is hard at work at his desk in his office at the House of Miles. Photograph ©2017 by Brian Cohen. Born on Wednesday, September 19, 1951 in Sioux City, Iowa — some people might comment that that truly SUX — a young Randy Petersen eventually moved to New York. At the age of 25, he started his employment at Chess King — which was a chain of retail clothing stores which catered to men — and was the Director of Merchandise Presentation by the time his tenure of ten years concluded in 1986. I found that interesting because at that time, my father — may he rest in peace — was a manager in New York at G+G, which was a chain of clothing stores which catered to women. Intrigued, Randy — who had always aspired to travel — decided to follow the advice of what he read and wound up enjoying a trip to Hawaii for free. At that time, members of frequent flier loyalty programs did not have to pay taxes and fees on award tickets, as they were truly free of charge. Not long after he returned, the water cooler became a popular spot, as co-workers would ask Randy for advice on how he traveled for free using miles and points. Randy never ceased to amaze them with his suggestions, tips and experiences — which led to him spending an inordinate amount of time during business hours offering his advice. He recalled to me his concern at that time about how his boss would feel about him hanging around the water cooler spending so much time giving advice to co-workers and neglecting his responsibilities. Randy initially believed that he was going to be reprimanded — until his boss asked Randy for advice on how he can travel for free, which included the Marriott Marquis frequent guest loyalty program. …but although he saw promise, Randy Petersen did not initially think that he would achieve the remarkable success he would eventually enjoy. At one point, he only had approximately $800.00 to his name — and he knew that there was no way he could survive on that in New York. Colorado Springs. Photograph ©2017 by Brian Cohen. Randy decided to load up his car with his worldly possessions and scout for locations outside of New York — particularly in areas in the western United States. After traveling to various cities, he wound up in Colorado Springs — and that was where he decided to settle permanently. Expenses — such as rent and utilities — and the cost of living in general were significantly lower than in New York; and the young Randy Petersen struggled to nurture and grow his nascent company. Heather Miller is currently the critical content manager for BoardingArea. Her eyes welled up as she attempted to choke back the tears — and failed — as Randy recounted his story of hard luck and trying times to me. This Macintosh computer is the first computer on which each issue of InsideFlyer magazine was composed. Photograph ©2017 by Brian Cohen. With his Apple Macintosh computer starting in 1987, Randy sold travel content through Compuserve and NewsNet; and eventually through America OnLine. Although production of the physical magazine ceased in February of 2015 after 28 years, 11 months and 11 days and is now defunct, a rejuvenated InsideFlyer still exists in electronic form — now comprised of articles, forums which used to be called MilePoint, deals, and other tools as part of building a global brand for frequent fliers. InsideFlyer is also available as separate Internet web sites dedicated specifically for frequent travelers in the Netherlands, Norway, Sweden, Denmark, Germany and the United Kingdom. Randy informed to me that the rejuvenated InsideFlyer project is still a work in progress at this time. As a disclosure, I occasionally write articles for InsideFlyer and have been doing so since 2015. Always thinking of how to further grow his small business and bring more publicity to InsideFlyer, Randy decided to launch the Freddie Awards in 1988 to recognize the most outstanding frequent travel loyalty programs in the world — but he did not want the ranking of frequent travel loyalty programs to be determined by only one person; so he asked readers of InsideFlyer and frequent travelers to cast their ballots. Thousands of people responded to the call for votes — giving frequent fliers a voice to honor the efforts of what was then a growing industry. As its ebullient master of ceremonies, Randy created an annual event to reveal the winners of different categories of the Freddie Awards each year, channeling his inner Elton John by wearing different outfits each year — whether those outfits included a top hat or cowboy boots. I attended several annual Freddie Awards ceremonies and witnessed Randy perform in his zone at home on stage, entertaining the growing audience of frequent travelers and industry insiders — elevating the ceremony to become an event which anyone with any relation to miles, points and elite status must attend. The only year which I can recall some employees of at least one airline not attending the Freddie Awards was in Atlanta — and that was because the official venue of the Freddie Awards in 2015 was the Delta Flight Museum at the world headquarters of Delta Air Lines. Ironically — despite hosting the event — Delta Air Lines did not win any Freddie Awards that year. After its 21st year in 2009, Randy decided to retire the Freddie Awards — but members of FlyerTalk worked to keep the tradition going by introducing the Frequent Traveler Awards in 2010 and 2011, which Randy attended as a guest. The Freddie Awards returned in 2012 by popular demand. The most recent Freddie Awards occurred on April 27, 2017 in Jersey City — 29 years, 4.2 million votes, 13 languages, 223 frequent travel loyalty programs and 237 countries and territories later from its humble beginnings. The location of the next annual event — which typically occurs on the last Thursday in April of each year and will most likely be on Thursday, April 26, 2018 — has yet to be announced. With the advent of the Internet and electronic mail, Randy created his first Internet web site on Friday, September 22, 1995 called WebFlyer as another part of his growing Frequent Flyer Network — as well as an electronic newsletter called MilesLink, to which I subscribed not long after its launch and benefited from some of the deals which were highlighted. WebFlyer became the first source of frequent flier information on the Internet — as well as the recipient of dozens of awards — but Randy was far from done. “Many people claim that I invented social media,” Randy had told me more than once over the years. “But I still thought I was right” — so much so that FlyerTalk was launched once again in May of 1998; and greater than 19 years later, FlyerTalk has almost 700,000 members who have posted almost 30 million times in almost 1,618,000 discussions. Tears were streaming down Randy Petersen’s face when he announced at a meeting of FlyerTalk moderators in Seattle at approximately 4:30 in the afternoon on Saturday, November 6, 2010 that he was resigning from all of his responsibilities with FlyerTalk, choking on his words in the process. He had announced the sale of FlyerTalk to Internet Brands back on Wednesday, March 7, 2007; but they eventually did not see everything eye to eye about the operations and future of FlyerTalk. That led to a lawsuit against Internet Brands — which was then settled amicably in March of 2011. There are moments of our lives when we can remember exactly where we were and what we were doing many years later. One of those moments for me was May 5, 1998, when I became the first person to create a post on FlyerTalk. My how those years—and those posts—have flown by. In the 4,569 days since, I’ve had the pleasure of a single goal, to pay life forward with advice and friendship for the frequent flyer. And you know what? It worked. Thousands of like-minded travelers joined in to also share their experiences and advice around the topic of miles, points and travel. Pretty cool huh? From that single post, FlyerTalk has grown to 15 million posts and the friendships that have grown out of these many posts have and continue to fill the hearts and lives of many a member. No one could be prouder of this than me. No one could be happier for this than me and no one could be more grateful of our members than me. So it is with the heaviest of hearts that I announce that I will be leaving FlyerTalk at the end of the year. My mom was always proud of who I grew up to be, and so am I. I like my principles and there’s nothing I enjoy more than working among those members of FlyerTalk who have earned my respect. Internet Brands has a transition plan and I’ll be working to support it during this period and have full confidence in the members of FlyerTalk to continue to make FlyerTalk exactly what was intended way back on May 5, 1998. These 4,569 days have provided me with a lifetime of memories and I am a better person for it. I can’t possibly think I can ever thank you all enough for what you have done for others and for me, but I’ll try—THANK YOU. I look forward to staying in touch with my FlyerTalk family and invite any of you who wish to do so to follow me on Twitter and/or add me as a friend on Facebook. Despite being advised by many people to stick to the forums of the Internet bulletin board known as FlyerTalk, Randy Petersen went full steam ahead anyway with the founding and growth of BoardingArea — and his instincts were correct, as BoardingArea is currently number one in his portfolio of businesses; and BoardingArea has since been expanded with Prior2Boarding and TravelUpdate. …but Randy has always believed in giving back whenever possible — and organizations such as Doctors Without Borders, Livestrong and Kiva have benefited from his generosity. This forum on InsideFlyer dedicated to community giving is only a mere glimpse into the benefactor known as Randy Petersen, who has changed the lives of many people for the better through his work. 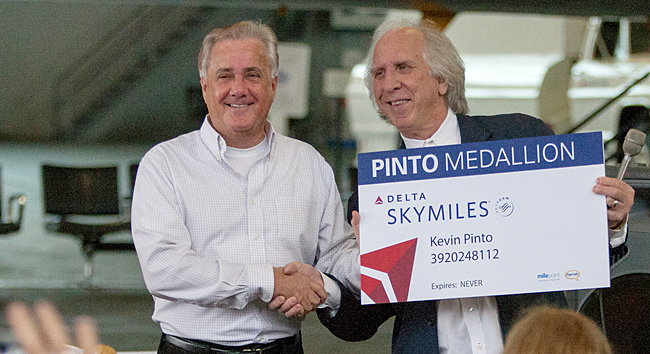 Randy Petersen honors Kevin Pinto with “Pinto Medallion ‘lifetime’ status” which is guaranteed never to expire at an event which honored Kevin on March 18, 2013. Photograph ©2013 by Greg Johnston. Despite the shaky and uncertain beginnings of his enterprise, Randy Petersen never borrowed a penny from anyone — and he is proud of that fact. Without going into details, Randy still deals with more than his fair share of adversity — but you would never know it from his positive demeanor. He always looks on the bright side of any situation. “Life is too short,” Randy once told me at an event in the District of Columbia two years ago. He believes in living life as positively as possible: stay positive. Although Randy does not travel nearly as much as he did in the past, he has no plans to retire anytime soon. His House of Miles building has been up for sale — the reasons of which I intend to document in slightly greater detail in a future article. He does not travel nearly as much as he did in years past — and that is just fine with him, which is something I never thought I would hear from him. In his slow transformation into becoming a self-proclaimed cowboy, Randy’s latest venture is a side business through which he sells what he calls “spur blocks” — decorative wooden blocks on which cowboys can store their spurs. A few of those spur blocks were on the floor of his office when I visited last month, and Randy proudly showed them to me — along with photographs of some other designs. He creates them with a few tools and his own two hands, bringing his design ideas to life. By the way, Randy did reveal a secret of sorts: despite his last name spelled as Petersen, he is of German descent and not of Scandinavian descent — but let us just keep that as our little secret the next time he visits Scandinavia. Ironically, I never officially interviewed Randy — I have simply engaged in conversations with him over the years; and he granted me permission to formally record portions of those conversations into this article, which is not meant to be a definitive history of Randy Petersen and the entities which he founded. I am certain that there is a lot more to Randy Petersen than I personally know. When I first met Randy at least a dozen years ago, I thought my relationship with him would be purely business and somewhat impersonal — but I consider him a good friend; and I feel honored to hear him repeatedly include me as one of his many friends whom he has known for years. …and many frequent travelers — including myself — are thankful for all that Randy Petersen has done for the community of miles, points and travel. All photographs ©2017 by Brian Cohen except for the photograph at the top of this article, which is ©2017 by Randy Petersen; and where as noted otherwise. Great article Brian. What is really impressive about Randy is how he has ridden the curve of print, forums and now blogs and, more often than not, made it work. However the empire ends up, his impact is immense. You should have mentioned points.com which is a little known side to the story. Thanks for sharing – loved the article! This is a really good article about someone I’ve enjoyed working with for 30 years. I first met Randy when I was a junior marketer at Continental and I’ve enjoyed many good times with him as my airline career continued at US Airways, Delta and United. His passion and honesty kept all of us who’ve managed loyalty programs on our toes and he made the programs better. I’m lucky to be able to call him a friend! In my opinion, anyone who’s ever done business with Randy Petersen is unlikely to speak of him in such glowing terms. Stellar article. Loved every word. And Randy, of course. I read this cover to cover when it arrived. It was a game changer. Randy use to say that he would start an online bulletin board, and so he did. When I first arrived on Flyertalk in September 2000, I was member 3300 ish. The website felt very cliquey. Screen names such as Catman (I’m allergic), and Rudy (he was the not liked mayor of NYC), turned me off, as did the lack of activity. Prodigy had just closed down, and some of the old Prodigy refugees joined Flyertalk. I’ve made lots of good friends over the years, including the author of this article, a fellow Brooklynite. I’ve met Randy multiple times, and he’s the real McCoy. Freddie Laker was a real gentleman. I had the pleasure at The Freddies. Randy always hosted us at no cost. Dinner and drinks on Randy! Thanks Boss. Flyertalk has given me the opportunity to have dinner anywhere in the world with new and old friends. I’ve hosted people in my home, and have been hosted. Internet friends aren’t ‘those’ people in 2017! One last thing, my wife and I couldn’t have flown4free and stayed4free all over the world without Randy’s help. The early daze of Flyertalk were really REALLY special. Oft forgotten fact: Randy didn’t own the domain flyertalk dot com — the “community” (NJDavid and/or Rudi?) bought it and gifted it to Randy at The Party in Paradise.